Publications for the Visually Impaired - Blindskills, Inc. Founded in 1983, Blindskills, Inc., is a nonprofit 501(c)(3) corporation funded by donations from readers, friends and benefactors. WHERE DO I GO FROM HERE? and PROMISES TO KEEP are written for individuals who are experiencing significant vision loss and for their friends and family members. Through this audio handbook and its accompanying print booklet, readers will find words of encouragement and resources to help cope with diminishing sight. PROMISES TO KEEP, the print booklet, explains to sighted family members and friends how to best assist a person who must learn to live with vision loss and gain new skills to maintain their independence. WHERE DO I GO FROM HERE? is now available in audio CD format, thanks to the generous assistance of the Spirit Mountain Community Fund. Also available in shipments of multiple copies for $5 per set. Call or email to request your free copy or to order in large quantities, see the bottom of this page. 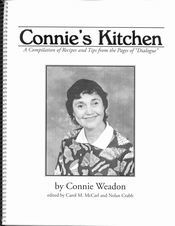 CONNIE’S KITCHEN: A COMPILATION OF RECIPES AND TIPS FROM THE PAGES OF DIALOGUE is a collection of columns written by the late Connie Weadon, a visually impaired cook and teacher, who wrote for DIALOGUE magazine for more than a decade. The recipes range from healthy main and side dishes to rich desserts. You can find recipes suited for novice and expert cooks as well as helpful suggestions for people who are just beginning to cope with vision loss. CONNIE’S KITCHEN includes a variety of cooking tips and techniques, and the resource section includes book reviews. I find it very convenient to have one-pound packages of ground beef, turkey, or sausage on hand, because they can be thawed quickly and used in so many ways, including appetizers, soups, and main dishes. Ground beef, turkey, and sausage can be used interchangeably in spaghetti sauce or in any recipe that calls for ground meat. One-half pound of ground meat equals one cup. When using ground beef, turkey, or sausage in a recipe, I break up the raw meat into a colander placed over a bowl. Then I microwave it for six minutes per pound of thawed ground meat. The bowl catches all the grease, and the meat can remain in the colander until it is cool enough for you to handle and crumble sufficiently. Coat beef cubes in flour, brown lightly with oil in a skillet, and set aside. Combine other ingredients in a crockpot or Dutch oven. Stir, add browned beef and stir all thoroughly. If beef broth was not enough to cover mixture, add enough water to rise three inches above ingredients. If using a Dutch oven, bring to a boil, stir, cover, and reduce heat to medium-low. Cook about two hours, stirring frequently. Add additional liquid as needed. CONNIE’S KITCHEN: A COMPILATION OF RECIPES AND TIPS FROM THE PAGES OF DIALOGUE is available for $10 per copy in braille and large print. Blindskills accepts MasterCard and Visa. Make checks and money orders payable to Blindskills, Inc.